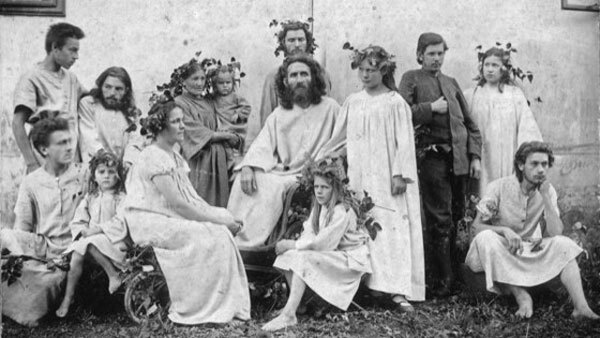 The Himmelhof was a vegetarian artists’ commune in Ober St. Veit near Vienna which existed from 1897 to 1899. Started by the artist and social reformer, Karl Wilhelm Diefenbach, this community of about 25 men and women was an influence on the community at Monte Verità in Switzerland. Influenced by the Lebensreform movement, Diefenbach gave his community the name “Humanitas”, intending it to be a workshop and studio for religion, the arts, and science. There the members could experiment with alternative ways of living such as common property, naturism, vegetarianism, devotion to nature and spirituality. Diefenbach surrounded by his communards at the Himmelhof. Karl Wilhelm Diefenbach (February 21, 1851 – December 15, 1913 ) was known as the Kohlrabi Apostle. He was a pioneer of Nudism and Non-violence. His ideas included life in harmony with nature, promotion of Polyamory and rejection of monogamy, turning away from any religion (although he was a follower of theosophy), and a vegetarian diet. Before founding the Himmelhof community at the edge of the Lainzer Tiergarten park, he had already lived in a project in Höllriegelskreuth, in Pullach in the Isar valley southern Germany. Started in 1886, this first “Humanitas” society was in an abandoned workers’ house near a quarry. It was here that he began his collaboration with the then 20 year old artist, Hugo Höppener, who took the pseudonym “Fidus” and who later started a commune in Berlin. At first, Diefenbach and the Himmelhof community were welcomed, then boycotted, then driven out of existence. When his Vienna commune went bankrupt, he moved to Capri and stayed there for the rest of his life. A circle of friends, which included the pacifist and Nobel Peace Prize winner, Bertha von Suttner, and the writer and cultural commentator, Michael Georg Conrad, supported Diefenbach’s projects. Members of the commune at the Himmelhof included international artists such as the painters Frantisek Kupka, Konstantinos Parthenis and Gusto Gräser (one of the founders of Monte Verita) and the animal rights activist Magnus Schwantje. Diefenbach started his new communal experiment in the Meierei on the edge of the Lainzer Tiergarten, a building which was occupied or had been occupied by the administrator (the Meier) of a noble or spiritual estate. This had been built in 1848 as a part of a large farm with an inn attatched to it. In the 1880s it had been rebuilt after a fire. Pflege der Wissenschaft aller Gebiete. Already over a hundred years ago, Diefenbach recognised what today is beyond argument: that humanity can only survive and live a good life when we look after the natural world. His Utopia was in contrast to the increasing industrialisation and the growth of big cities, the beginning population boom, air pollution, military expansion, the arms race and war, all of which lead to poverty, need and suffering in the greater part of the population. He saw the commandment, “You shall not kill” as being valid also for the animal kingdom. He was against the consumtion of meat, and saw in the murder of animals one of the causes of war. And in the period of the commune, he visited the Peace Congress of 1898 with Bertha von Suttner. He propagated “Light and Air Baths” for the naked body. On the other hand, the rules which he gave to the community were often in contrast to his own life style. He was polyamourous while preaching chastity, sexual abstinence and obedience to his followers. He even checked their post. he saw himself as a prophet and master whose word was law. One factor in the downfall of the community was the rebellion of Gustav Gräser. 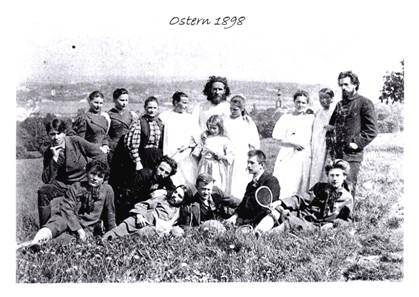 Himmelhof members, Easter 1898. (Gusto Gräser on the outside left). This book describes, through letters and diary entries, the dramatic story of this artists’ community.